Wow!!!! This is a month of blessing by MTN and all its subscribers because more and more cheaper call rates and internet data plan keep emerging and still we are hoping for the best in the upcoming months. 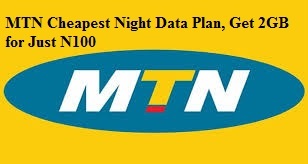 This is latest MTN midnight data plan of N25 for 500MB and is blasting like bomb. With 4 Sims, will be given 2GB for just N100. Today, you will learn how to get 2GB for just N100, using Four MTN Sim cards. » Get Four (4) MTN registered Sim cards. » Your Four (4) MTN sims must be on the MTN Pulse tariff plan, but if you are not sure of the plan you are already on, simply dial *123# on each of the sim, to confirm which plan you are on or just dial *406# to migrate to MTN Pulse plan. » Make sure you have a minimum of N30 in/on each of the sim.